It would be impossible to separate memories of my school days from World War II, because they are intrinsically woven together — a tapestry of events etched deeply into my mind. The air raid warnings were a daily event and bombs dropping, as enemy planes flew overhead en route to the city of London England. V1 and V2 rockets, otherwise known as Doodlebugs, rained down on the county of Kent as they fell short of their target (London), or were shot down by our guns. This was the scenario for my childhood. Aged 11, my school days were spent doing lessons in underground air raid shelters, which I hated, and which were consequently responsible for my claustrophobia. These shelters consisted of long concrete tunnels built underneath the school grounds, with inter-connecting tunnels for other classes. This was difficult for both teachers and pupils. When the noise of gunfire and/or bombing became too close teachers would start singing songs like, ‘Roll Out The Barrel’, and ‘We’re Going To Hang Out theWashing on the Siegfreid Line’. Pupils sang as loud as they could to smother their fear that maybe the next bomb would be a direct hit on their shelter. The journey to and from school each day was a ritual instilled in my mind. My mother would hand me my satchel and gasmask, as I went out of the door. 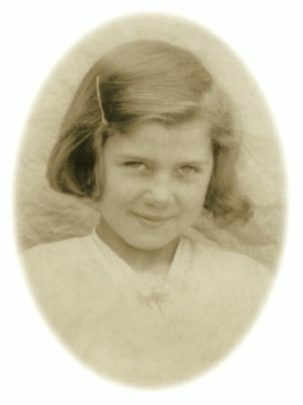 Her final words were always the same: “Have you got a clean handkerchief?” If the air raid warning siren went off when we were en route to school, we were to take cover in the nearest house or shelter. This was because of the danger of being machine-gunned as well as the danger of bombing. There are two memories that really stand out. The first one was prior to our all-day lessons in the shelters. We had only just settled into our seats in class when the by now familiar air raid siren broke into our concentration. We immediately followed our ‘fire drill’ instructions and filed out of the classroom to the shelters, as we had been taught. Just as the last class (mine) entered the shelter the bombs began to fall very close by. The blast knocked my teacher off her feet and down the steps. Blood was everywhere as she hit her head hard on the concrete floor. We all huddled together; you could almost smell the fear in the air. The teacher, Miss Williams, holding a handkerchief to her head to stem the flow of blood, began to sing. “Ten green bottles hanging on the wall,” Slowly but surely my classmates and I joined in, until, rising in a crescendo our voices drowned out the noise of the battle, taking place above us. Later when we finally emerged, the air was thick with smoke. You could see clouds of it billowing up from the nearby railway works where my two sisters worked. The smell of burning, and the dust from the debris made our eyes water, and caused many of us to cough and splutter on the way back to our classrooms. Later, I was to find out the school my younger brother and sister attended had been hit. My home had been destroyed when the street took a direct hit, killing many of my neighbours and friends. I was reassured that my mother, grandmother, and grandfather were safe. It was evening before I knew that all my family had survived that terrible day when Hitler decided to bomb our little town. My other memory is of the day my friends and I were playing in a field beside the river. Suddenly, an enemy plane dive-bombed us! Machine-gun bullets hit the ground all around us as we ran for cover. Soon we were watching a ‘dog fight’ as one of our spitfires engaged the enemy in a battle in the sky above us. I remember screaming, “Get him. Kill him”, and many other terrible things, but such is war I’m sorry to say. Then silence fell over our little group. Our upturned faces watched horrified as the enemy plane burst into flame. That awful realisation that we were witnessing a life or death situation, is a feeling I can never forget. Suddenly I was shouting, “Jump, please jump. Use your parachute”, and my friends were shouting with me. We wanted the enemy pilot to live. There was an immense feeling of relief felt by all of us, as the parachute billowed open above my head. We followed its descent, and arrived on the scene as the pilot was being lifted onto the back of an army jeep. Armed soldiers surrounded him. Our eyes met — I don’t know his thoughts of course, possibly hatred, afterall he had tried to kill my friends and I only moments earlier. Yet, the shock of seeing a young man not many years older than I was I remember! Yes, I remember, because it was the day I realised my childhood was over. The next day many of my friends would not make it back to school. Somehow it was never the same for me. Are there memories that for you symbolise the end of your childhood?